Thanks for the review; I read the novel in Chinese, and regretted not knowing that an English translation was in the pipeline! I do hope that Ho-Ling works on the subsequent novels, so that I can read more of Ayatsuji in English. I read the 'Maze House Murders' in Chinese as well, and I had the same impression of it as I had of 'Decagon House Murders': enjoyable, fair, but slightly thin on clues. Interestingly enough, I would actually label 'Decagon House Murders' as a 'retrospective locked room/ impossible mystery'. But only in retrospect - and subtly so for only certain parts of the narrative...! Technically speaking, you could label this story as a retrospective locked room mystery, but it really shouldn't be put in the category of impossible crime stories for the same reason Christie's Death on the Nile isn't considered a locked room/impossible crime story. Because it really isn't. I hope Ho-Ling finds an ingenious locked room mystery in style of "The Lure of the Green Door" for his next translation. That or I'll (badly) write one myself. Thanks for reading & the review! One problem TDHM has is that while it is overpopulated with characters who /think/ they're a detective, the narrative actually lacks a real detective figure. 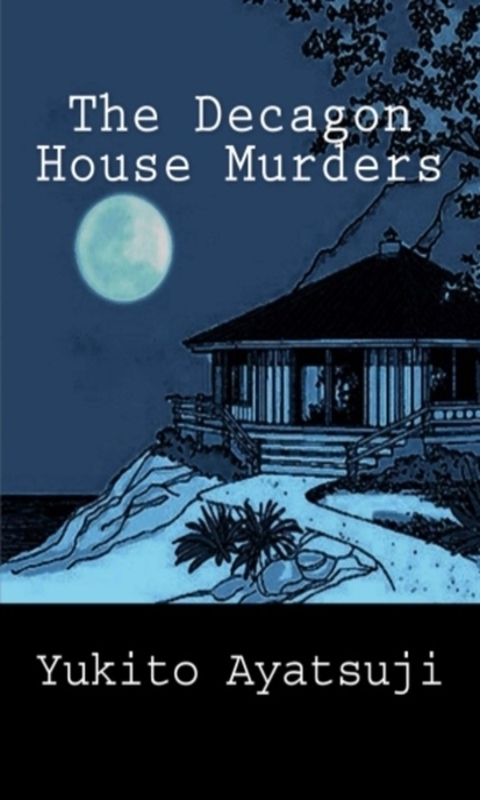 The way the crimes are explained at the end is similar to the conclusion of ATTWN, but whereas most mystery novels end with a recap by the detective of all the hints, TDHM does not do that, despite it actually being reasonably clued (see the ravings/post on clues on my blog today), which is actually a shame. This is because the puzzle is not meant to be solved by the detective figures, but by the reader: in fact, only the all-knowing reader could (logically) deduce the identity of the murderer. I think Ayatsuji mentioned in an essay that's why TDHM is quite different from the rest of the series, because it was not designed as a series from the start. Random story about translating: you wouldn't believe how much trouble I had to go through to get "the sentence" exactly on the very final line of the left page, so the impact would be saved for last. By the way, I think "the sentence" is still one of the most brilliant sentences in all of detective fiction, as you basically go "Oh, so that's how they did it!" and "But that's impossible!' at the same time. About further translations: more like nothing here to comment ATM rather than no comment. I do have to note that for obvious reasons, I can't just post random translations of any story I like on my blog anymore. Unless the copyright expired. I remember reading how the French translator of Carr's The Burning Court had a similar struggle in carrying over the full-impact of The Burning Court from English, which he managed to by switching two sections and it ended up being an improvement of the plot. I section were never switched in the original English editions, but Carr reportedly agreed that the change was an improvement on the original. Aren't most of Kido's (earlier) Hanshichi stories in the public domain?! ...there wasn't a specific target for that one poisoning (shades of Christie’s Three Act Tragedy) and there weren't any clues as to how the murderer was able to identify the poisoned cup. So, no, not really an impossible crime novel, but still very grateful that you published it. How embarrassing then, sending Ho Ling a message to notify him about him this release only later to realize he was the translator. Now that long-since comment he made on one of your articles about sending you 'something' all makes sense. Great job TanteiKid on making dreams reality! Good to see you still hanging around in the mystery sphere, Origami, but did Ho-Ling send me anything? I don't remember that post at all. Also funny that you mentioned the Kamikakushi Village murder case as I have rewatched it twice in the past 3 months. One viewing for the sake of returning to a mystery that I remember so fondly and it has been a long time since I watched it the first time. A subsequent viewing to show it to a friend of mine who is not that into mysteries but could really appreciate the ingenuity of the twist. To me that story is a small masterpiece with its six episode structure the first one serving as a kind of prologue mystery to set up and familiarize the watcher with the upcoming bigger mystery, the last episode serving as an epiloque where smaller questions are answered and the story gets worked towards a bittersweet ending. Still anticipating the day my Japanese becomes good enough so that a purchase of the manga would make sense. "and has arguably the best use of bizarre architecture"
It is kind of disappointing to read this, as I have felt I have read so few titles in the mystery genre but already encountered some of its 'best-of' titles. "It is kind of disappointing to read this, as I have felt I have read so few titles in the mystery genre but already encountered some of its 'best-of' titles." Don't worry. I have read very little compared to my fellow bloggers such as Curt Evans (The Passing Tramp) and John Norris (Pretty Sinister Books) or professional fans boys such as Bill Pronzini and the late Derek Smith. My opinion isn't the final word on these matters.